Isobel goes missing and the boys go off on a mission to find her. They find her in the desert with no idea how or why she got there. They take her to Michael's air stream and she gets ready to go home, but Noah shows up and asks her whether she's addicted to alcohol. She says no, and he leaves her. She melts down and Michael says they both know she was the one who killed the girls. Liz steals a dictaphone and listens to Grant calling the police complaining about floating bodies. Liz ambushes him and he shows her footage of her sister and the two other girls floating. A gunshot rings out. It's Wyatt. He kills Grant and puts Liz in a box and sets it on fire. Max shows up to save her in the nick of time. Liz later realizes Max is hiding the truth about her sister's death, and Max confirms Isobel is the killer. 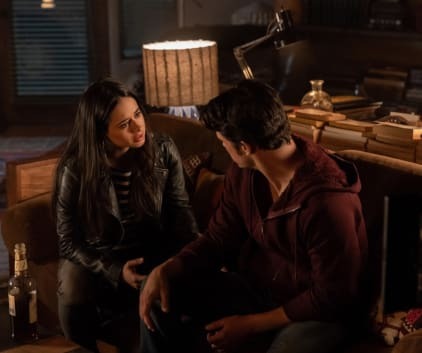 Elsewhere, Kyle and Alex bond, and Kyle learns that Rosa was his half-sister. Alex finds alien stuff in the cabin in the woods.